Raise your sanitized hand if you can’t stand Purell. Ugh, the scent of it is enough to make this lady with hypochondriacal tendencies take her chances with germs when no water is available. Yeah, I’m talking about myself here. For several years now I’ve been using CleanWell hand sanitizer. It became a bit more difficult to buy after Target stopped carrying it. I can still order it online though. I have no problems with CleanWell, but my husband complains rather theatrically about the scent, particularly if I spray it in the car. I should insert here that my husband is a super smeller. Well, not technically, but he might as well be. So, I was up for trying a new natural hand sanitizer, and I received a bottle of Burt’s Bees Aloe and Witch Hazel Hand Sanitizer as a gift. The smell is mild and pleasant. Claims to be 100 percent natural. The active ingredient is 62% ethyl alcohol. I suppose the witch hazel also helps with the product’s germ killing abilities, plus the aloe is nice, but I miss the more potent botanical blend that is CleanWell. No refills. The spray bottle works fine, but you have to buy another one when it’s empty. Burt’s Bees doesn’t offer larger bottles for refills. However, this is still more eco-friendly than buying wipes. No flip top. It’s rather difficult to keep up with the top of the sprayer. I know that sounds lazy, but just think about it: 300 sprays equals 300 chances to lose the top and have a really sanitized purse. CleanWell wins here for having a flip top. And there’s the whole thing about Clorox owning Burt’s Bees. What? You thought the bee man still owned it? I don’t hate Burt’s Bees Aloe and Witch Hazel Hand Sanitizer, but I’m not madly in love with it either. I haven’t seen it around much in stores, which means it would be another hand sanitizer I’d have to order online. As for my husband, he’s yet to complain about the scent. I’m not sure whether he’s trying to be pleasant, or if it does smell better to him than CleanWell. I’m sure the answer will be revealed in due time. 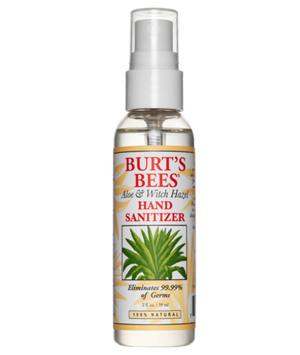 Have you tried Burt’s Bees Aloe and Witch Hazel Hand Sanitizer?